Good news to those who are searching where to buy Cherry Mobile’s newest Android phone Cosmo X2, it’s now available online. You can have this phone for the price of 11699 pesos at your favorite online store Lazada Philippines. This can be availed also via BDO installment for as low as 739.03 pesos a month. 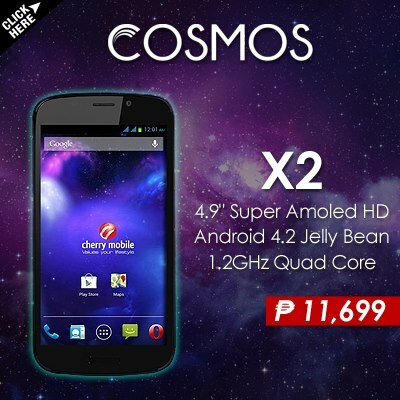 They are only selling the Cherry Mobile Cosmos X2 at color black and offer next day delivery within Metro Manila. This handset is part of their Cosmos Series, it features a SUPER AMOLED screen with 18 megapixels camera and a quad core processor. Other Cosmos handset unveiled by Cherry Mobile are, see list below for you to check out. Camera and screen are noticeable features that Cherry Mobile Cosmos X2 owns. Offering a 18 megapixels photos too much if you’re just a basic user that uses the taken pictures and upload it to social media sites like Intagram and Facebook. A back up front camera also give you 8 megapixels, enough to capture good quality selfie shots and video calling purpose. The screen also is a big bonus, not just a regular HD but a SUPER AMOLED that usually featured and used by known brand like Samsung. If you’re looking for a feature packed phone, you can consider this as your no. 1 option.